Buckeyes give back — to the university, to their communities and across the world. Three Arts and Sciences alumni are doing just that by helping those suffering from hearing loss from the ongoing airstrikes in Syria, rebuilding New Orleans after Hurricane Katrina struck and providing medical services to those in need in Haiti. Airstrikes deliberately targeting Syrian civilians have led to unprecedented rates of hearing loss among child refugees. While there are a number of nongovernmental organizations and humanitarian aid organizations on the ground providing food, clothing, water and crucial medical assistance, audiological care is not a priority. Without it, however, children will suffer delays in language, communication and academic development. Tasnim Hamza, a recent graduate of the doctor of audiology program in the Department of Speech and Hearing Science, was born in the United States. Her parents are Syrian, and she has relatives who live in Aleppo, a city in northern Syria. As fate would have it, Hamza received an email from a friend asking her to join a humanitarian aid trip to refugee camps in Lebanon. Without hesitation, she signed on as the audiology coordinator and the only student-member of the world’s first deaf-led humanitarian aid mission, sponsored by Deaf Planet Soul, a Chicago-based nonprofit providing resources and support for the deaf community. In March 2017, Hamza and the team of audiologists and therapists from Deaf Planet Soul arrived on the ground in Lebanon. For 10 days, they moved from camp to camp setting up makeshift diagnostic stations, dispensing hearing aids, teaching sign language and providing mental health therapy to Syrian refugee children and their parents. Because this was the first humanitarian group to offer audiological care in the camps, no one knew for sure what to expect in terms of numbers and demand. Hamza and the team began their days at 6 a.m. and worked 12- or 13-hour shifts. For most of the children, it was the first time they had sat down with therapists and audiologists for treatment. The team brought 130 hearing aids to disperse, but the demand far exceeded that, and the team made the difficult decision to give each child only one rather than two, to help as many as they could. At least 50 percent of the children were profoundly hearing impaired or deaf. For these children, hearing aids were of no help. Hamza and others had to teach them — and their parents — enough basic sign language to survive. Hamza, who is fluent in Arabic, didn’t learn sign language until she boarded the plane to Lebanon. 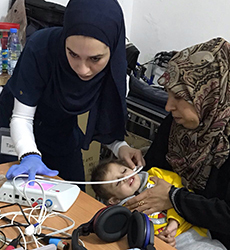 According to Gail Whitelaw, director of Ohio State’s Speech-Language-Hearing Clinic and an audiologist herself, the humanitarian work that Hamza has undertaken is exactly the type of outreach that Ohio State audiology strives to have in the world. 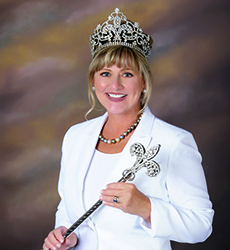 From using her public relations firm to aid in the repopulation of a parish devastated by Hurricane Katrina to being crowned goddess of the largest all-female Mardi Gras krewe, Karen Boudrie Greig’s connection to the Big Easy has blossomed quickly. Greig earned her degree in broadcast journalism from Ohio State in 1982 before starting her career as a reporter and anchor for a station in Corpus Christi, Texas. She moved to New Orleans in 1992, where she continued her broadcast journalism career as a reporter and anchor until 2001, when she started her own marketing and public relations firm. In August of 2005, the dynamic and character of New Orleans changed forever when Hurricane Katrina slammed into the coasts of Louisiana and Mississippi. Neighborhoods were flooded. Buildings were destroyed. There were people who were trapped, scared and alone. The chaos and tragedy of that fateful summer left deep scars that are still felt to this day. Though New Orleans has managed to emerge from the ashes galvanized and united, communities in and around southeastern Louisiana are still impacted by the storm 13 years ago. And Greig remains immersed in the effort to restore and rebuild. St. Bernard Parish — which is situated on the shore of the Gulf of Mexico on New Orleans’ southeast side — was obliterated. A 25-foot storm surge created by Katrina destroyed levees protecting the parish from the sea, leaving almost the entire community flooded. Today, much of St. Bernard’s infrastructure has been rebuilt, and the community has gone from recovery mode to redevelopment mode. Sold on St. Bernard is a program dedicated to moving folks back to the community. Greig’s public relations firm built the program’s website, handles its social media, develops marketing strategies and promotes its media. “They’re redeveloping smartly, and they’re doing it better than it was done before as far as revitalizing neighborhoods and bringing back communities,” Greig said. Greig’s tie to New Orleans doesn’t end there. Last February, she led a massive Mardi Gras parade down the city’s historic St. Charles Avenue as goddess of the Mystic Krewe of Nyx. The krewe, which formed in 2012, carries out charity and philanthropic work throughout New Orleans. Greig became involved with the krewe because of her role as president of the Military Officers’ Wives Club of Greater New Orleans. This year, she is helping fundraise for Hero Dogs, a group that trains service dogs for military veterans. Greig once thought New Orleans would be just another stop on a longer journey. But now, after 26 years, she can safely say she’s found her destination. His undergraduate years as a math major prepared him for the next step in his education: attending medical school at, you guessed it, Ohio State. Once he completed the program in 1987, he moved on to his residency, focusing on internal medicine and pediatrics. 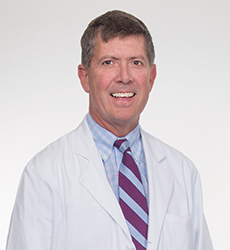 From there, he became a pulmonary specialist for both adults and children, practicing in Nashville, Tennessee. Peters and his family have been in Nashville since 2001, but it wasn’t until three years later that he started doing outreach work in Haiti. Peters has been traveling back and forth to Haiti for 15 years now, with no plans to stop any time soon. His missions are primarily medical, but they also focus on clean water projects at the same time, because many of the primary forms of disease in Haiti are caused by dirty water. In addition to clean water and general medical care, the mission offers women’s health services and, for the past few years, dental care. And, though his journey has been long, Peters has not forgotten his time in Columbus and the impact it’s had on him, every step of the way.